Morning Manna is a daily devotional reading covering the Bible from Genesis to Revelations. The reader will have studied the Bible in depth from cover to cover. 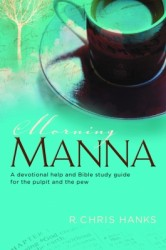 Morning Manna is a great resource for prayer time, devotion, research and studying the scriptures. Great resource for Bible Study topics, Sermons, Sunday School lessons or general knowledge of the Scriptures. First, I like the design of the book and the colors. I love the look and feel of the book, which is really smooth unlike other books I’ve read. 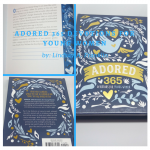 If your desire is to learn more about the scriptures from the Bible or to start a morning devotion and prayer time then this is the book for you. Just as some people need to start the day with a cup of coffee or they can’t function, we as Christians should begin our day with devotion and prayer time. Our hearts desire should be to study the scriptures and meditate on God’s Word on a daily basis. The day should not start until we have had prayer and quiet time. Each lesson includes a Daily Bible Reading, Today’s Verse, Brief overview of the scriptures and Topics for specific word devotion. I must admit I don’t always get to have my prayer and quiet time like I should everyday with my very early risers. However, Morning Manna is one of the many devotional tools and resources that I have available to me to continue to grow, mature and meditate on the Word of God. I have found from my own personal experience that when I do study God’s Word I have a renewed sense of peace and I can endure and function a lot better than not having read or studied. I know you will enjoy this great devotional as I have. Disclaimer: I received a copy of this book for review courtesy of Bring it On Communications in exchange for my honest opinion. I was not compensated in any way. All thoughts and opinions expressed were solely my own. « Stride Rite Memorial Day SALE!